If you want to create the perfect place to entertain guests in your backyard, an outdoor kitchen could be the solution. Outdoor kitchens not only offer space within your landscape for cooking and food preparation but can also serve as an extended area to host guests. 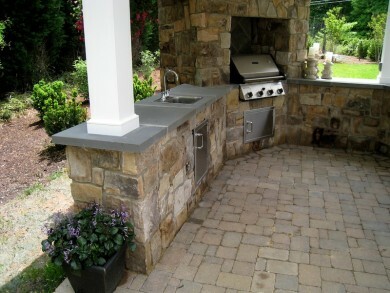 At O’Grady’s Landscape, we can custom build your outdoor kitchen in McLean, VA to suit your every need. From lavish cooking stations to outdoor bars with all the essentials, we’ve got the skill and experience you need for the picture-perfect outdoor living space. Request a consultation to get started today—703-533-5001! The purpose of your new kitchen—cooking, serving food, hosting outdoor parties, etc. We can discuss the details during your initial consultation and once we’ve established a basic plan, proceed with the material selection and more detailed drawings. Some options for the patio area within your outdoor kitchen design include Pennsylvania flagstone or pavers in brick or stone. We can also integrate a seating wall into your outdoor kitchen design if you’re interested in adding more space to host guests or sit outside. Make the most of your summer with an outdoor kitchen by O’Grady’s Landscape! From extensive kitchen setups perfect for cooking and dining to outdoor bar patios to host parties, we will tailor the design to your exact vision. Our landscape designers have years of experience in all aspects of hardscaping, and we have a reputation for excellence in outdoor kitchen installation throughout the McLean, VA area. Let us help you help you build the outdoor kitchen of your dreams. Contact us today to schedule your initial consultation for a design in McLean, VA—703-533-5001.